These birds are being sold to consumers as a healthy food choice, when in fact that big white breast the size of a filet mignon signifies a bird who was a synergy of sicknesses when he or she was still living and breathing in the equivalent of a cesspool, imprisoned in a body that poultry scientists have described for decades as biologically unfit and unhealthy. Many people switch from beef to chicken believing chicken to be a healthier food choice. For decades we've been told that chicken is lower in fat and cholesterol than red meat, so it's ironic that during this time, obesity has risen dramatically in Americans, including young children. Chicken consumption isn't the prime culprit, but it isn't blameless either. For one thing, chicken is not low in fat. Light, skinless chicken has about 18 percent of calories from fat, and skinless roast dark meat chicken is 32 percent fat. Like all meat, chicken is permeated with inherent artery-clogging saturated fat similar to beef -- similar because the cell membranes in all muscles, regardless of species, have cholesterol inside the membrane, about 25 milligrams per ounce. Cholesterol occurs mainly in the lean portions of meat. The saturated fat that permeates these portions raises cholesterol levels by stimulating the liver to make more cholesterol (Barnard). Contrary to the myth of lean cuisine, chicken flesh contains more fat than ever before -- at least 15 percent more than in the 1960s. In 1988, the National Research Council noted that genetic selection for body weight bred chickens whose systems could not properly synthesize the high calorie diet they were being forced to eat. The excess food was deposited as lipids and chickens developed not only grossly enlarged muscle tissue but pathological obesity (Gyles), aided by growth promoting antibiotics. On March 11, 2014, On Point, hosted by Tom Ashbrook on National Public Radio, discussed a possible link between animal consumption, antibiotics, and overweight. "Do Antibiotics Make Us Fat?" asked whether "antibiotics plump up humans the same way they do animals." Do the high levels of Salmonella and other pathogens in animal products put consumers at risk not only of foodborne illness but of weight gain linked to the cumulative effects of antibiotic residues in chickens and other animals being eaten? Agribusiness uses antibiotics to control the bacterial diseases that rage in farmed animal production operations, reflecting the filth, crowding, and stress of these operations. Antibiotics are also used as artificial growth promoters. In 1949, a chemist named Thomas Jukes identified the tetracycline being dumped by the pharmaceutical company, American Cyanamid, into the Pearl River north of New York City, as the cause of overgrown fish in the river. In laboratory experiments it was found that baby chicks fed antibiotics "grew 10 to 20 percent faster than those on plain rations," and that piglets "did even better." As a result, antibiotic growth promoters entered animal agriculture in the 1950s, a process described in The Washington Post article, " What We Really Pay For Cheap Meat." Antibiotics are great for treating bacterial infections, but too many antibiotics can weaken the human immune system as well as the immune systems of birds and other animals, increasing one's susceptibility to food poisoning and other illnesses and increasing the inability of overstressed animals to handle the pathogen load to which they are exposed from birth to death. The correlation between Salmonella, antibiotics, and industrial poultry production was described at the International Egg Commission's 1995 conference in Stockholm, Sweden where researchers explained that by the end of the 1980s, a disturbing phenomenon had arisen that coincided with the consolidation of industrial poultry and egg production. The intestinal bacterium Salmonella enteritidis had migrated from its natural habitat in the hen's intestinal tract to her ovary where it was infecting her eggs as they were being formed. This pathology led to an epidemic of Salmonellosis in humans, which led to the increased administration of antibiotics to chickens. However, upping the load of antibiotics fed to chickens "as an easy way to control the situation," instead of controlling it, facilitated the ability of Salmonellae bacteria to adapt to the antibiotic onslaught (Evans). Contamination of poultry products with poisonous bacteria is not just a byproduct of an inept poultry slaughter inspection system. Before large-scale production took over, normal intestinal microflora -- the mixture of hundreds of different types of harmless bacteria that occupy the lining of each bird's intestinal tract to provide immunity, the same as in humans -- was transferred from adult birds to their offspring by way of their droppings, creating an immediate natural defense. As the chick grew, its own microflora developed so that by 6 months old, the bird was healthy and strong. In industrial production, by contrast, not only is the intestinal microflora of the young bird incomplete; it is disrupted by the overuse of antibiotics. Antibiotics bloat the birds artificially by causing water retention and disturbing the composition and interaction of the birds' microflora, increasing their susceptibility to colonization by Salmonellae and other bacteria transmittable to humans (Fowler). The pathologies linking farmed animals to consumers of animal products may be difficult to sort out precisely, but patterns are emerging, even though the diseases caused by "human controlled evolution" in poultry and other agricultural animals are more complicated than a quick summary can show. Still, a great deal of information is available. A 2013 article, "Trends in developmental anomalies in contemporary broiler chickens" in International Hatchery Practice observes that chickens with extra legs and wings, missing eyes and beak deformities "can be found in practically every broiler flock," where "a variety of health problems involving muscular, digestive, cardiovascular, integumentary, skeletal, and immune systems" form a constellation of debilitating diseases. Dr Andrew A. Olkowski, DVM and his colleagues state that poultry personnel provide "solid evidence that anatomical anomalies have become deep-rooted in the phenotype of contemporary broiler chickens." 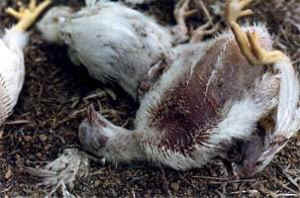 These birds are being sold to consumers as a healthy food choice, when in fact that big white breast the size of a filet mignon signifies a bird who was a synergy of sicknesses when he or she was still living and breathing in the equivalent of a cesspool, imprisoned in a body that poultry scientists have described for decades as biologically unfit and unhealthy (Duncan). Ashbrook, Tom. 2014. Do Antibiotics Make Us Fat? On Point. National Public Radio 11 March. Barnard, Neal D., MD. 1990. The Power of Your Plate: A Plan for Better Living. Summertown, TN: Book Publishing Company. Brownlee, Shannon. 2000. What We Really Pay For Cheap Meat. The Washington Post 21 May: B3. Evans, Terry. 1995. IEC gathers in Stockholm. Egg Industry October: n.p. Fowler, N. 1990. Competitive exclusion -- the way forward? International Hatchery Practice 5.1. Gyles, Roy. 1988. Technological Options for Improving the Nutritional Value of Poultry Products. Designing Foods: Animal Product Options in the Marketplace. Washington, DC: National Academy Press, 297-310. Olkowski, Andrew A., DVM, et al. 2013. Trends in developmental anomalies in contemporary broiler chickens. International Hatchery Practice 28.1, 28.2.